The Formula One roadshow returned to Spa for a second attempt to stage a race which had been scrapped hours before the scheduled start in June because a freshly-laid surface was falling apart. The conditions still proved testing, because of intermittent rain, but that only served to underline the skill of Ayrton Senna and raise questions as to what he might have achieved had his Lotus had better reliability. Understandably much of the attention in the build-up centred on the surface but cooler autumn temperatures and light rain helped keep it raceable. It was certainly not to blame for the accident which sidelined Niki Lauda when he hurt his wrist in practice after the throttle on his McLaren stuck. McLaren tried to get its former driver John Watson brought in as a late replacement but that was blocked by Ferrari which was mindful of the closeness of the constructors' championship. Championship leader Alain Prost took pole in the solitary McLaren with Senna alongside him, and behind them came Nelson Piquet who spun at the first corner and somehow avoided anyone hitting him. By the second corner Senna led from Prost and Nigel Mansell, but tyre stops were crucial. The race had been designated wet but within a lap it was apparent the track was drying fast. Very soon the cars came flooding in to make changes. Senna came out best as Lotus gave him a set of scrubbed tyres whereas Mansell, in second, was given a new, unscrubbed, set. It allowed Senna to get his tyres working sooner and he powered past Mansell on the climb uphill to Les Combes with Prost benefitting from a spin by Mansell to take over second place. On the 19th lap rain again started to fall causing another flurry of pit stops. 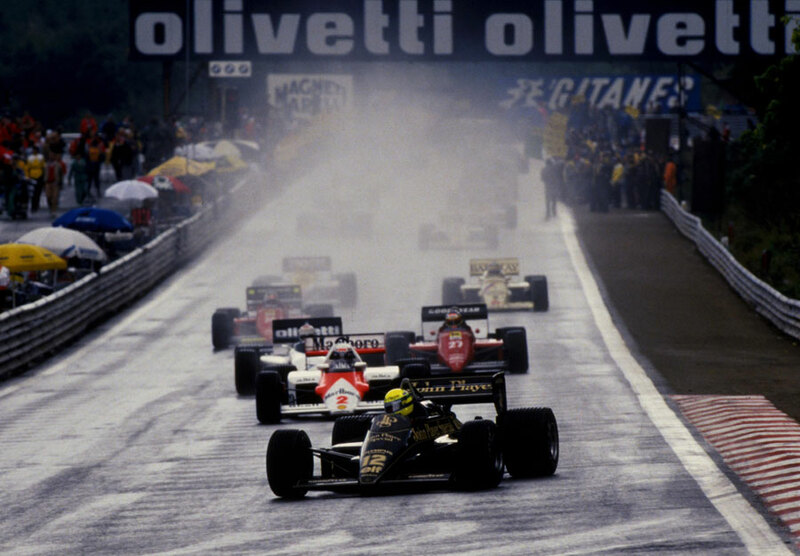 Behind Senna, Mansell moved back ahead of Keke Rosberg with Prost in fourth. Rosberg and Mansell fought a grim battle for second which only ended when Rosberg was forced to pit again for more tyres. Prost's four points extended his lead over the fast-fading Michele Alboreto to 16 points with three rounds remaining. Alboreto, forced by mechanical issues during the warm-up to use the spare Ferrari, was one of the first retirements.